Ever since humans have walked on earth, we have continuously explored and discovered new and different things while simultaneously making advancements and adaptations to enhance our way of living. It wasn’t until 1961 that the first human lived and breathed outside of planet Earth after being launched into space on a Mercury-Redstone rocket. Ever since then, space has been a large fascination and incomprehensible topic that many astronomers have been trying to discover more about. Apollo 11, the first space flight that launched a man to the moon in July of 1969, made world history and increased nations hope for discovering more about space and potentially finding other life forms. But what if it was a hoax? Many conspiracy theorists indicate that NASA staged the moon landing (along with the shape of the Earth) with the help of other potential organisations, and these theories have managed to sustain the public’s interest for over 45 years. Some of the arguments and conspiracies against the 1969 moon landing have at least some relevancies that should not be disregarded. Most of the alleged theories that the moon landings between 1969 and 1972 were faked stem from NASA’s very own photographs. Many people argue a famous image of Edwin Aldrin is a hoax, due to him showing up too brightly in the image, even though he is in the shadow of the lunar module. The shadows also are not parallel with each other, which conspiracists declare could only happen with multiple light sources. Moon landing sceptics argue that if the photos the astronauts took on the moon were actually real, the shadows would be completely black. This is because the sun is the only source of light. The absence of any atmosphere on the moon would not be able to scatter the light around and create the shadows shown in the photographs. This argument is used by sceptics to enforce the idea that the moon landing was filmed in a studio on Earth with an atmosphere, as opposed to the moon in outer space. Another point raised that creates some suspicion around the moon landing was the image with no stars in the sky. Many Sceptics believe that the lack of stars in the sky indicates that NASA somehow forgot to paint the stars on the studio backdrop when they staged the moon landing. A further suspicion that conspiracy theorists have brought to attention is the moon landing footage. Multiple theorists accuse the moon landing footage of being fake or staged due to factors such as the footprints and the American flag that has been planted on the moon. 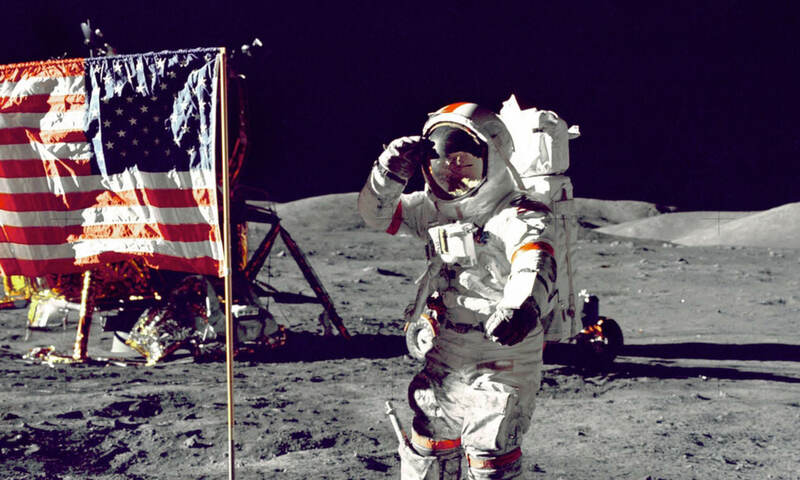 In the video of Astronaut Charles Duke landing on the moon, it seems as if the flag he plants is flapping on the wind which would be impossible, as outer space has no air and therefore no wind. In addition, another theory is that the footprints left by the astronauts would not be as well defined as those photographed, as there is no moisture on the moon and moisture is the thing that holds footprints together. So, whether man walked on the moon or it was staged in a studio here on earth, the suspicion that NASA staged the moon landing and humans have never in fact set foot on another planet will always remain. Could 9/11 of been a hoax? 9/11, the three numbers everybody now associates with a day of terror and tragedy. Most media put the responsibility of World Trade Center destruction in the hands of 19 militants associated with the Islamic extremist group al-Qaeda. We were led to believe these people hijacked four airplanes and carried out suicide attacks against the United States. But could there be more to the story, truths that have been hidden from the world for 17 years and have yet to be revealed? Many conspiracists have been led to believe that explosive devices were secretly planted in the World Trade buildings prior to the attacks. Although it would be almost impossible to plant explosives in the World Trade Centre buildings with over 50,000 workers inside without anybody noticing, some say we can’t disregard this theory completely. Many leading engineers at the scene of the attack believe the Twin Towers collapsed due to controlled demolition. Evidence to support their argument lies within the footage of the twin towers collapsing. According to science hobbyist Chris Mohr, no tall steel frame building in history had ever collapsed due to a fire before September 11, 2001. The massive steel framework that melted during the collapse of the towers is said to have been strong enough to withstand the heat of the fire that eventually caused it to collapse. Only weapons of mass destruction such as bombs could essentially cause enough damage to collapse the entire Trade Centre building. Another mysterious 9/11 theory claims that the United States had advanced knowledge of the potential terrorist attacks and disregarded or even assisted the attackers. Possible motives behind this act of terrorism include the opportunity to justify invading and running natural gas pipelines through Afghanistan as a form of retaliation and way to stop any further strikes. According to multiple conspiracy theorists, there had been multiple warnings and threats to the United States prior to the attack on the Twin Towers and World Trade Centre. In May of 2001, the chief of the CIA’s counter terrorism center stated that “we were going to be struck hard and lots of Americans were going to die”. In August 2001, the current president George Bush received a review of all the threats posed against the United States by Osama Bin Laden and his terrorist network. Bush had received many direct warnings about potential terrorist strikes against the United States from the start of the year 2001 yet refused to let the public know until it was too late. The Pentagon (the headquarters of the United States Department of Defence) was also targeted and attacked on September 11, 2001. Many suspicions were raised regarding the destruction of The Pentagon after no plane wreckage was found at the scene of the crime. The Pentagon was destroyed after a Boeing 757 plane supposedly flew directly into the western side of the building. Although there were multiple witnesses that saw the plane crash into the building, conspiracy advocates still argue that it could have been a missile or different type of plane that flew into the Pentagon. Thierry Meyssan, a French author introduced the idea in his book, The Big Lie, stating that The Pentagon was struck by a ‘satellite-guided missile’ as part of an intricate military coup. "This attack could only be committed by United States military personnel against other U.S. military personnel,” he wrote. Proof to back up this argument includes footage of the Pentagon being struck by an object. Out of the 85 videotapes that the FBI seized that could potentially show the plane striking the building, only one video actually showed the impact of an object colliding into The Pentagon. Missile theorists have analysed the footage and believe the object is too small to be a Boeing 757 plane and more accurately represents a cruise missile. Despite the evidence pointing towards the Pentagon being attacked with a missile as opposed to an airplane, we must also take into account the camera providing the footage is also filmed with a security camera with an ultra-wide lens angle and therefore footage can easily be distorted. To this day, people are still debating whether The Pentagon was hit by an aeroplane like the media claims, or if there was another weapon used in this attack. Despite all these arguments and theories about what really happened the on the day of 9/11 2001, these are in fact just theories. Although there are many questionable facts and suspicions around this event, until any solid evidence is released we may never know what really happened.